It is for the first time in 21 years since the governance in J&K was returned to ‘elected representatives’ after six years long hiatus enforced by the insurgency that the state legislature could not hold a formal session in Srinagar. In next two weeks, the durbar move offices will begin winding up to reopen in Jammu early November. The upcoming Diwali would virtually close the offices much ahead of time. This is a small indicator of democracy’s malfunctioning in BJPDP era. For constitutional requirements, the session of the legislature must be convened once in six months. This requirement was fulfilled in July when Governor NN Vohra summoned a special session on the Goods and Services Tax. The brief session, initially conceived to be held in-camera (journalists were barred from recording proceedings and their protest forced speaker to apologize), turned out to be another feather in the cap of Mehbooba Mufti led government. A craftily passed resolution was the requirement. There was hardly any other business. The half-year governance from Srinagar did not make any significant change on the ground. The functionaries of the government must be comparing the period with the corresponding span of last year and by that yardstick counting it a movement forward. For them, the comparison is significant because last year they were not allowed by the rebellious people to venture out of their homes in the aftermath of Burhan Wani’s killing. With calibrated security arrangements, tight vigil on educational institutions (epicenters of this summer’s protests) and curbs on internet, the youngsters remained largely under control thus offering lawmakers an uncontested movement to Kashmir periphery. 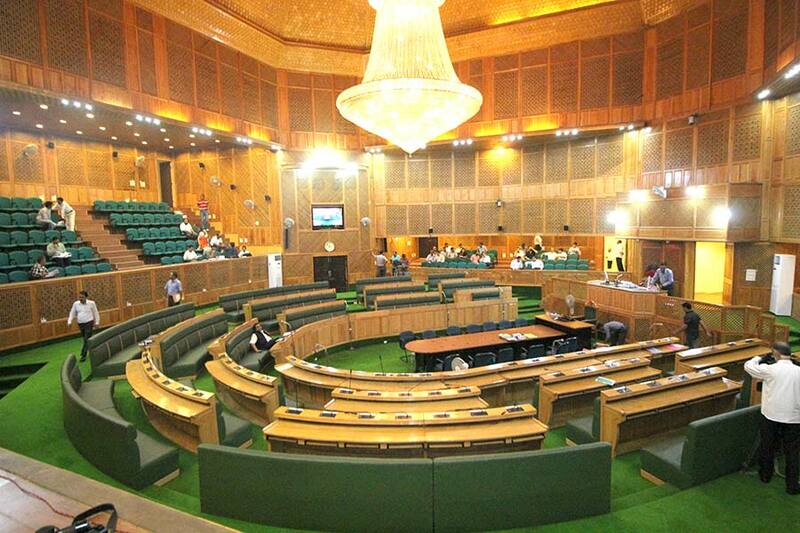 With the closure of offices in Srinagar, the assembly would complete three years, its first half term. Six months were consumed by the two parties in framing and re-framing the coalition, first when late Mufti Muhammad Sayeed took time to forge alliance with the BJP and then after his demise when Mehbooba Mufti created an unsubstantiated suspense by delaying to step into her father’s shoes. Effectively, the father-daughter duo is nearing completion of two and a half years of governance by the end of year 2017. The questions are being asked as to whether the people of the state, or specifically those living in Kashmir, received the much-touted reprieve, sense of security or economic uplift. It is naïve to talk about the political intervention and initiation of dialogue process with the dissenting stakeholders. These initiatives were promised in the Agenda of Alliance, packaged as coalition roadmap. While the top level offices operated from Srinagar, Delhi largely looked the other way. Prime Minister Narendra Modi, who had started his innings with monthly visits to J&K, did not arrive in Kashmir. Home Minister Rajnath Singh, apparently the No 2 in Delhi, too was evasive until early September when he spent four days to talk with officials and “public” delegations, popular with the Delhi VVIPs. There is no evidence suggesting that Singh’s visit brought about any significant change on the ground. The customary talk of inviting everyone for talks, even if reciprocated by Mirwaiz Umar Farooq, did not move beyond the TV screens. On the contrary, the sensitive issues like the calculated attempts to fiddle with state’s special status were made. The PDP ministers and leaders privately make believe that their there was no threat to the special status but they have nothing concrete to showcase that corroborates their wishful thinking. Modi’s assuring smile to a group of ministers and delay in hearing of the case in the supreme court seeking abrogation of article 35 A, till Diwali, is all that PDP possesses. In fact, the half-hearted demand of the opposition National Conference to call a special session of the legislature to discuss the imminent threat to the special status of the state, was not paid heed to by the government. During these six months, the government may rightly boast black-topping hundreds of kilometers of roads, organizing sports events and concerts of Abba Hanjura and Adnan Sami at SKICC, the fact remains that the security issues dominated its functioning. The short film showcasing the beauty of Kashmir coupled with humbling hospitality of its people for tourists might have gone viral on the internet, but it did not result in attracting hoards of tourists who seemingly have perpetually abandoning Kashmir now. The reason is not somewhat different. The release of short film was followed by a Fidayeen attack outside the Srinagar airport. In May when the durbar had arrived in Kashmir, the biggest challenge with the government was the growing sway of militants in south Kashmir. A sustained anti-insurgency campaign has resulted into colossal damage to militant ranks, particularly to their leadership. Mehbooba Mufti might be counting it as a big achievement but there is no evidence to suggest that this has brought about significant change on the ground. The hatred and disillusionment of people persists and it can take any turn if measures are not taken. The mysterious braid-chopping incidents have the potential to influence the situation drastically.